Following comprehensive investigations carried out by the Tourism and Antiquities Police, members of a gang specialising in illegal excavation work and the looting of antiquities have been caught red-handed. 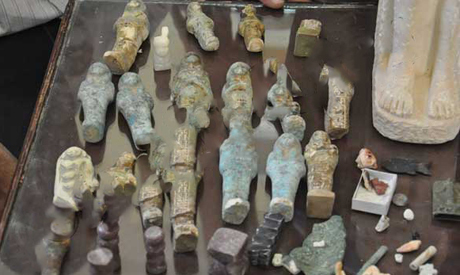 The gang leader was arrested in his home in Giza's Abu Sir village, where a collection of 17 authentic Islamic coins, 12 Ancient Egyptian ushabti figurines and a replica statue were found hidden inside an oven. According to the police report, this collection emerged from illegal excavations carried out by the gang members and a number of villagers in a remote archaeological area in Abu Sir. General Osama El-Nawawi, head of the investigation department at the Tourism and Antiquities Police, referred the perpetrators for investigation. He also requested that an archaeological committee be dispatched by the Ministry of Antiquities to examine the authenticity of the confiscated objects.